The LFGI Series is our line of all stainless steel, lead-shielded Compounding Aseptic Containment Isolators. This shielded isolator provides advanced product and personnel protection while compounding sterile radiopharmaceuticals. 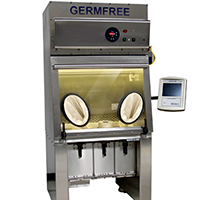 The unit functions as a Glovebox while operating under negative pressure to meet NIOSH recommendations. Additionally, it complies with USP 797 regulations for operation outside of a cleanroom. 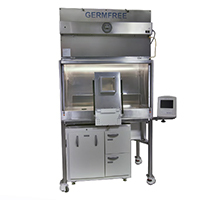 Germfree’s RADIOSAFE Series is a line of Class II Biological Safety Cabinets that incorporate a 3/4″ lead shield to provide protection while compounding radiopharmaceuticals. These units provide ISO Class 5/Class 100 HEPA-filtered airflow. Our RADIOSAFE Class II, Type A Biosafety Cabinets meet all requirements for USP 797 compliance and are constructed from 100% Stainless Steel.